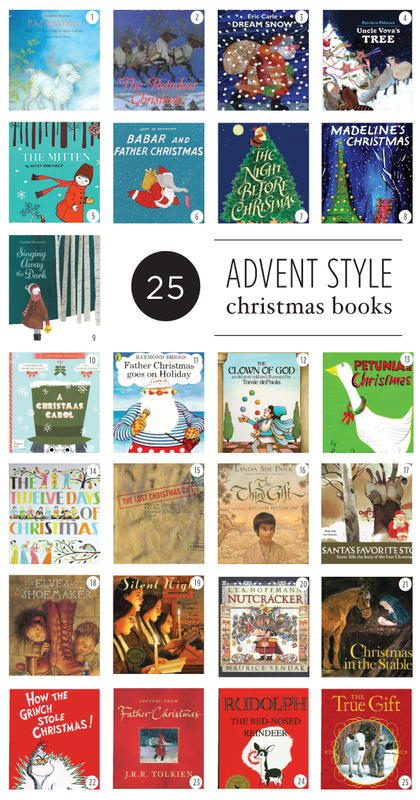 Last year we started the advent style tradition of reading Christmas and winter themed books each night in the month of December. It was such a big hit for our girls (now ages 2 and 6) we are doing it again this year. I love the notion that we can mix up our selections each year with library titles and then deliberately choose to make purchases focusing upon ones that we absolutely adore. I'm quite selective about children's book in general and when you are talking Christmas books it adds a whole new layer to my book neurosis. Classic and solid story lines, beautiful illustration/design and high marks on review meters are my general guidelines. I also like to keep it real and adaptable with our kid's ages since our girls are still pretty young. 1 Pashmina the Little Christmas Goat - We loved this book so much from last year I purchased it. The story is heartwarming and the watercolor illustrations are gorgeous! 2 Reindeer Christmas - Another selective purchase but worthy of a repeat, it is so beautifully illustrated. 3 Dream Snow - Eric Carle is sure prolific eh? 4 Uncle Vova's Tree - A Russian tale. 6 Babar and Father Christmas - Got to have a little Babar! 7 The Night Before Christmas - I remember my Grandma reading me this version growing up. 8 Madeline's Christmas - Madeline is a household favorite. 9 Singing Away the Dark - Julie Morstad's illustrations are fantastic, can't wait to get my hands on this. 10 A Christmas Carol (BabyLit) - This will appeal to our two year old, for sure. 11 Father Christmas Goes on Holiday - This looks quirky and fun. 12 The Clown of God - Looking forward to reading this old French legend. 13 Petunia's Christmas - I love Richard Duvoisin books. 14 The Twelve Days of Chirstmas - This vintage beauty makes a repeat. 15 The Lost Christmas Gift - I received this in the mail a few days ago and really enjoyed it. 16 The Third Gift - Got this last year and it remains on the list. A great overall story about Myrrh. 17 Santa's Favorite Story - The Story of the First Christmas through Santa's eyes. 18 The Elves and the Shoemaker - We are going to this play this year, should be fun to read too. 19 Silent Night: The Song and Its Story - A story about the beloved carol. 20 Nutcracker - Trying different versions of this until we find our favorite. This one is illustrated by Maurice Sendak, last year we did this one . 21 Christmas in the Stable : I'm excited to get my hands on this one as it is written by Astrid Lindgren! 22 How the Grinch Stole Christmas : Classic and keeper. 23 Letters From Father Christmas : Tolkien wrote this one and our book club is reading it this month, will probably read the girls only excerpts as it is on the longer side. 24 Rudolph the Red-Nosed Reindeer : A classic and look forward to seeing this vintage version. 25 The True Gift: A Christmas Story : Excited to read this one. So what would you add to the list? What are your favorites you know, the ones that you come back to year after year? ps. Last year's list here and here. We had the Christmas in the Stable book growing up. It's a sweet one! This is such a lovely list. I don't have any to add because I think I discovered a few new treasures from your list. I'm off to check out the other lists from last year. Wooo. A wonderful book I read to my kids on xmas is Twas the night before Christmas - A Magical Cut Paper Edition. The kids love the paper cut pop outs. Wow, thanks for the post - Always nice to hear about other favorites! Have you heard of "Snowmen at Night?" There is another rendition of "Snowmen at Christmas." Is is one of my favorite Christmas books let alone children's books. You should read it if you ever get the chance. I am adding you to my frequent visited page on my site! Cheers. I missed you! and your posts!! I wish I would have done this for my children when they where younger. I am thinking of buying them a book each year, though that they can keep and read to their children one day. oh this is FANTASTIC! i love the mix of literature with the advent calendar. I just LOVE this idea!! Thanks for sharing! Some are well-loved from my own childhood and others are fairly recent. All of them bring a smile and sweet moments shared!